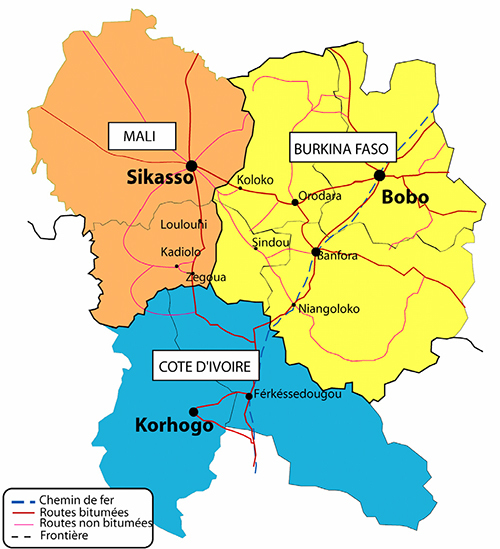 On 14 May, the three Prime Ministers of Burkina Faso, Côte d’Ivoire and Mali launched a special economic zone in the SKBo triangle, composed of the regions of Sikasso (Mali), Bobo Dioulasso (Burkina Faso) and Korhogo (Côte d’Ivoire). It is the first special economic zone in West Africa that operates across borders. The legal framework foresees there will be fiscal advantages for companies that decide to operate in this cross-border area and this could contribute to the integration of local economies. In particular, the three governments aim to attract private sector investment in agribusiness, agro-industry and the mining sector. The precise details of the cross-border arrangements were discussed during a meeting between the three Prime Ministers at the launch ceremony in Sikasso. The UEMOA Commission and partners support the development of an integrated territorial development approach for this area. Cross-border co-operation activities have been developed in the SKBo triangle for several decades. The region is part of the ECOWAS Cross-border Initiatives Programme (PIT) launched in 2005 that aimed to increase co-operation frameworks along intra-community borders.